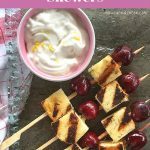 Simple and fun, these grilled cherry shortcake skewers highlight sweet summer cherries for a light and festive dessert. Our family has a huge sweet tooth so any time I can work fresh fruit (or even vegetables) into dessert, I do what I can. My mother-in-law makes a delicious pound cake so last summer we played around with there cake to give it a slightly healthy twist. 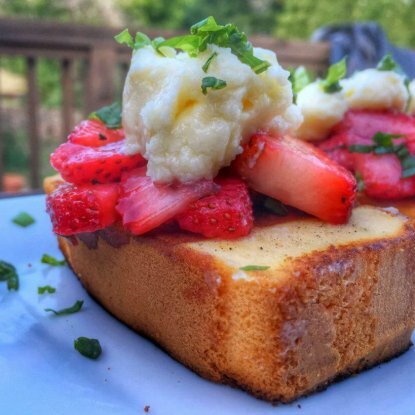 While I would never pass up a thick slice of her pound cake, topping it with fresh cherries or grilled and dipping into yogurt are two fun ways to serve. Also, each skewer uses less cake than I might eat if I were going to cut a slice so it helps with portion control too. Well, if I don’t eat 3 skewers! It is important to brush each cake cube with melted butter or spray with a thin layer of cooking spray. This step keeps the cake from sticking to the grill. Also, make sure to use a hot, clean grill to keep your cake cubes from sticking. 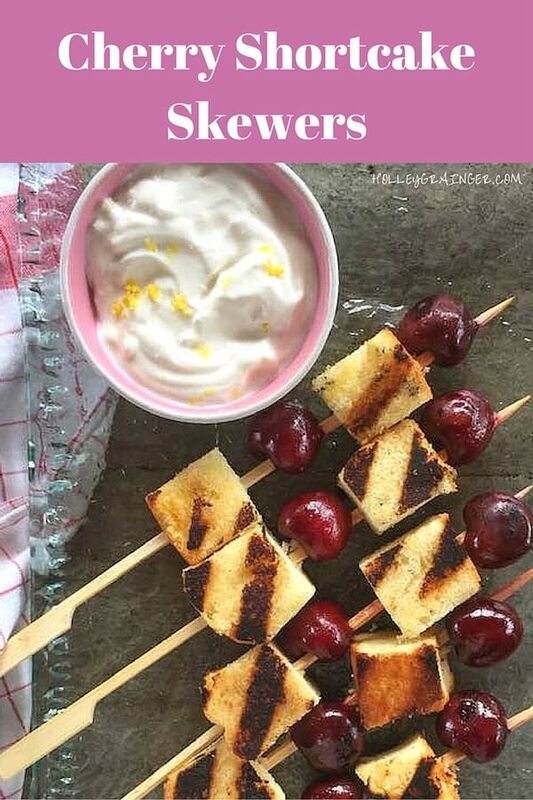 Grill each skewer for 5 to 7 minutes or until your cake is toasted and your cherries are soft. 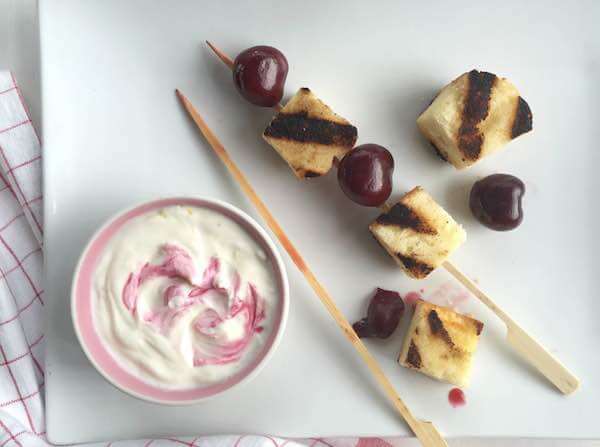 I have played around with the recipe to grill cake on a skewer and cherries on another. 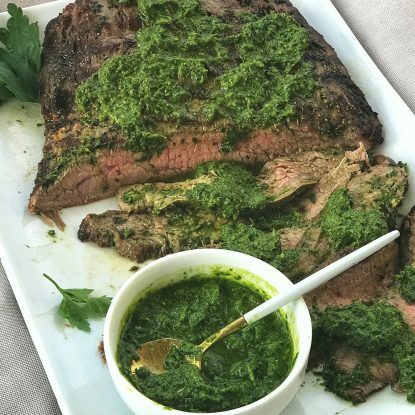 If you plan to deconstruct the skewers or find that your cherries aren’t getting soft but your cake is burning, you may want to consider this option. If you use wooden skewers, don’t forget to soak them before grilling to prevent them from burning. 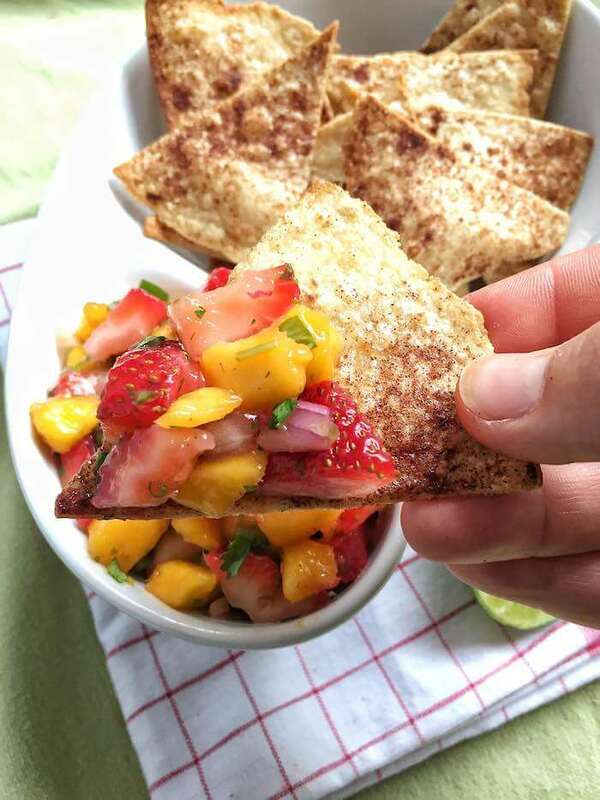 Love fresh summer produce? 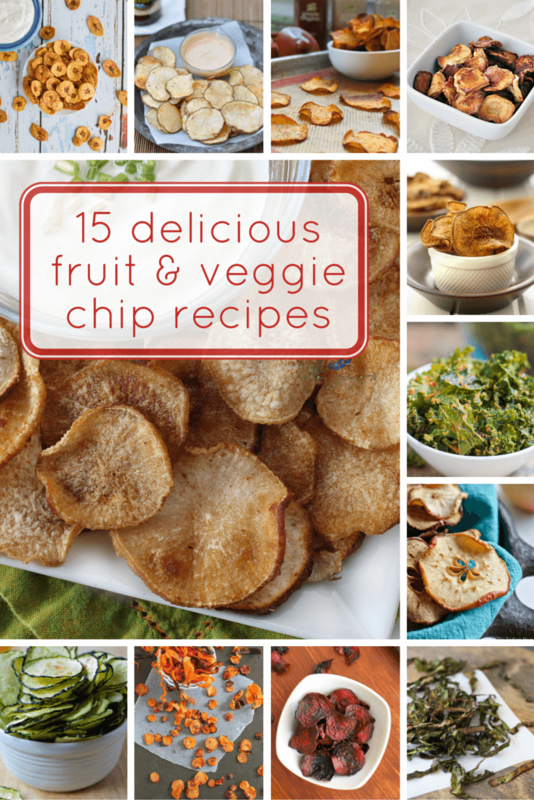 Check out some of my other favorite recipes highlighting fruits and veggies! Cut cake into 16 1-inch squares. 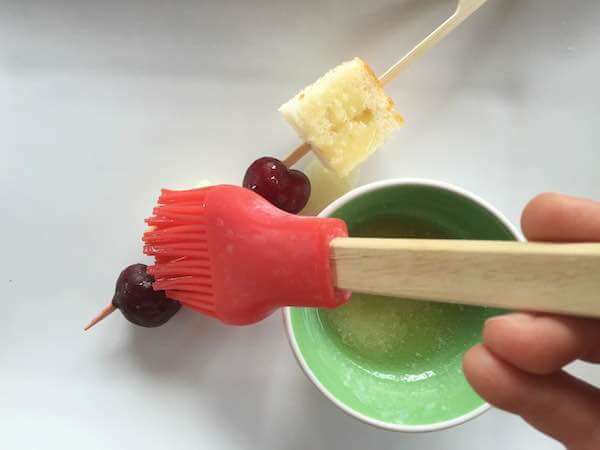 Thread each skewer with 2 cake cubes and 2 cherries. If using wooden skewers, make sure to soak the skewers in water for 10 minutes before threading to prevent burning. Brush cake cubes lightly with butter to prevent sticking. 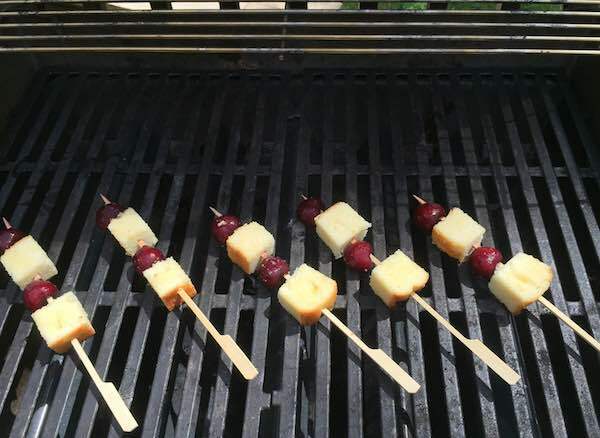 Grill skewers over medium heat for 5-7 minutes or until cake is toasted and cherries are soft. While skewers cook, stir lemon zest into yogurt. Serve immediately. I don’t always cook my corn. 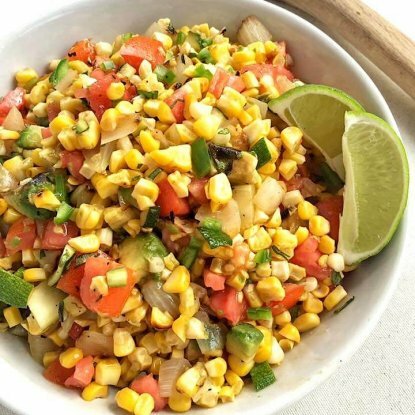 Sometimes I shuck it, cut it right off the cob and use it in salads, etc. You also can boil or microwave it. I hear you with the southern heat–I’m in Alabama! Good luck!